“The last thing he said to his mother on the phone was “Mumma, don’t worry, I’m coming home soon.” But since that night, he hasn’t woken up. On some days he has more than 10 episodes of seizures in just an hour. Sometimes, his hands and legs move because of the seizures, and other times it’s happening in his brain. It's quietly killing him. ” - Amjad, Saheb's father. 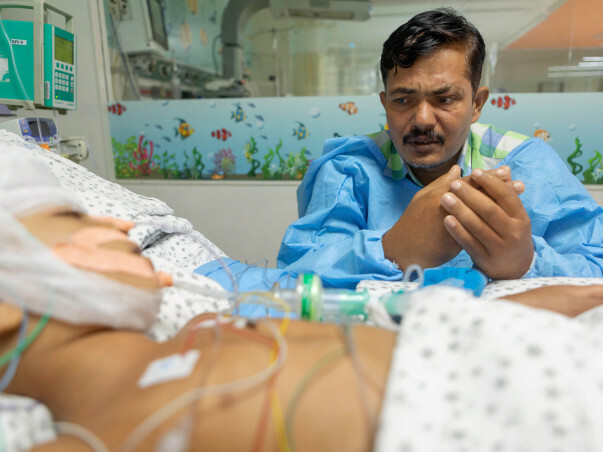 4-year-old Saheb has been in the PICU on ventilator support for 5 days now. Amjad spends all day in the waiting room, eyes fixed on the door of the PICU, waiting for any news that the nurse brings about his child. When he gets a chance to go in for a few minutes, he tries talking to him. But Saheb lays there with eyes closed, and motionless. 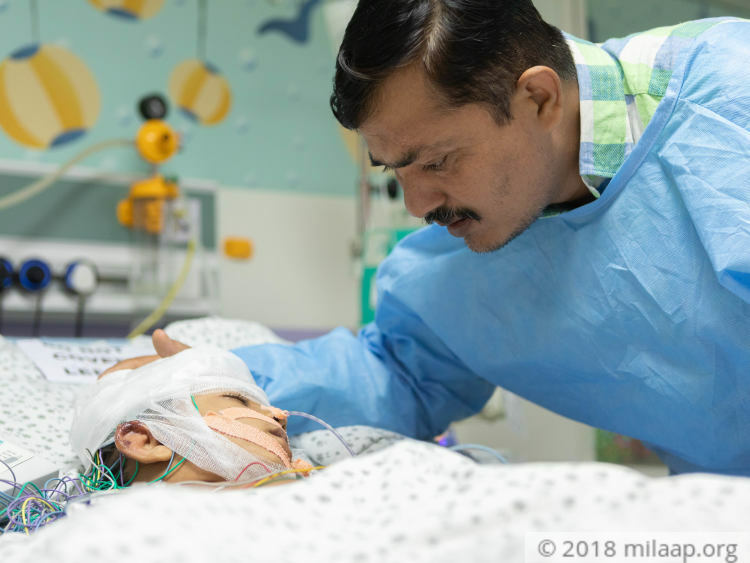 Without continued PICU care, Saheb may never wake up again. It was just 10 days ago that little Saheb Hussain was happily playing with his cousins during Eid. Amjad and Sultana also had another reason to celebrate – they were blessed with a baby girl 2 months ago. 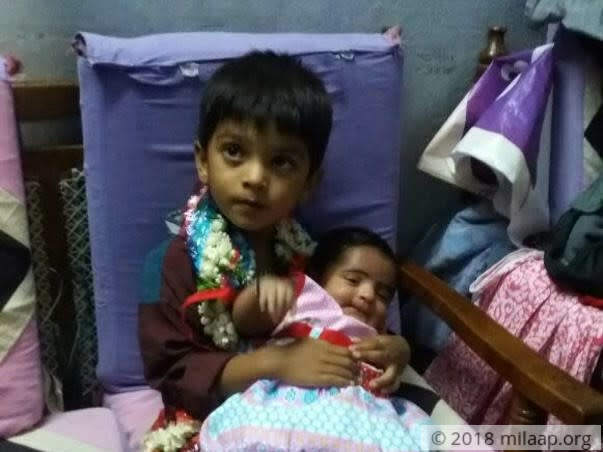 Saheb was thrilled to have a younger sister and begged for his mother to let him carry her. 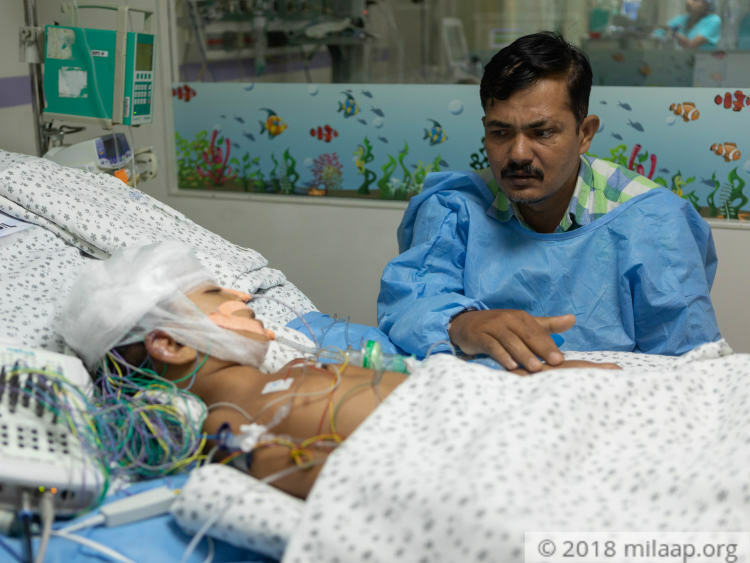 In all their happiness and chatter, little did they think that just 4 days later, he would fall critically ill.
Due to excessive neural activity in the brain, Saheb has recurring epileptic seizures. He’s on medication and anesthesia for the same, but only continued care and close medical attention in the PICU will help him survive. While Amjad stays in the hospital, Sultana is with their newborn at home. She constantly calls Amjad and recalls her last conversation with her son. A feeling of helplessness overcomes her as she pictures her son alone in the PICU. Amjad works as a home guard for the police and earns Rs. 15,000 per month. He has spent more than 2 lakhs for Saheb’s treatment in just a week. 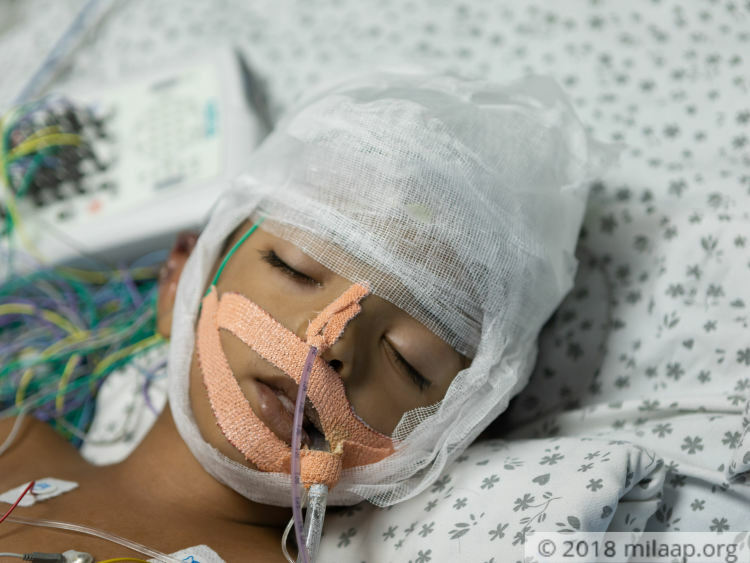 Amjad and Sultana have sold the little jewelry that they had and borrowed from relatives to start their son’s treatment, but they don’t have the means to go on without help. 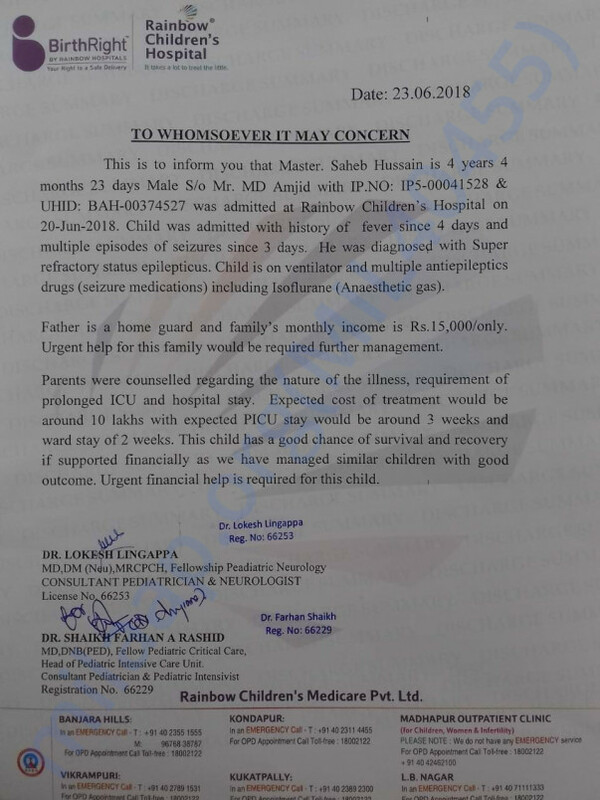 Saheb Hussain needs to stay in the PICU for 3 more weeks to survive. This is his only chance to get better and reclaim the childhood that was so cruelly snatched away from him. Amjad has done all he could to get him treated till now, but he doesn’t have the means to afford 10 lakhs for his treatment. Only you can help save little Saheb. Saheb was showing small signs of improvement. 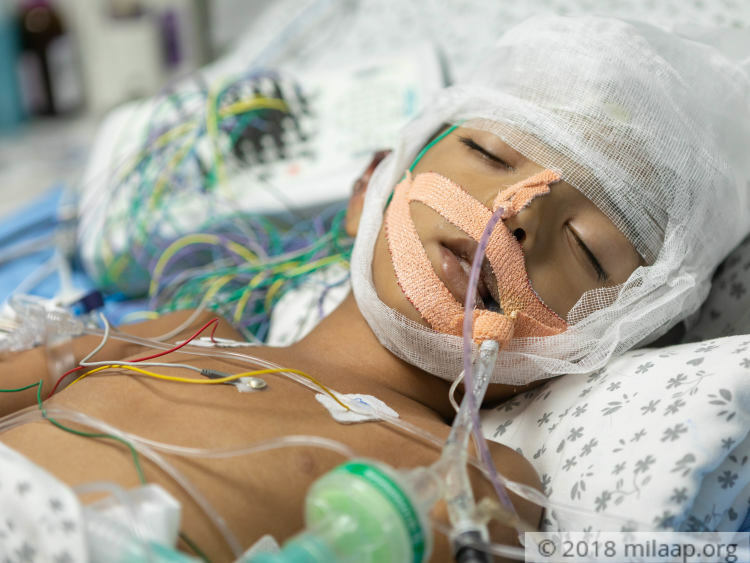 The child continued to have clinical and electrical seizures despite multiple anti-epileptics. He was on regular medication as prescribed by the doctors mainly antibiotics and he was being closely monitored by the doctors. Family was conveyed about the child's health condition and how critical was it to him to receive the treatment. However, family wanted to leave against the medical advice due to personal reasons. 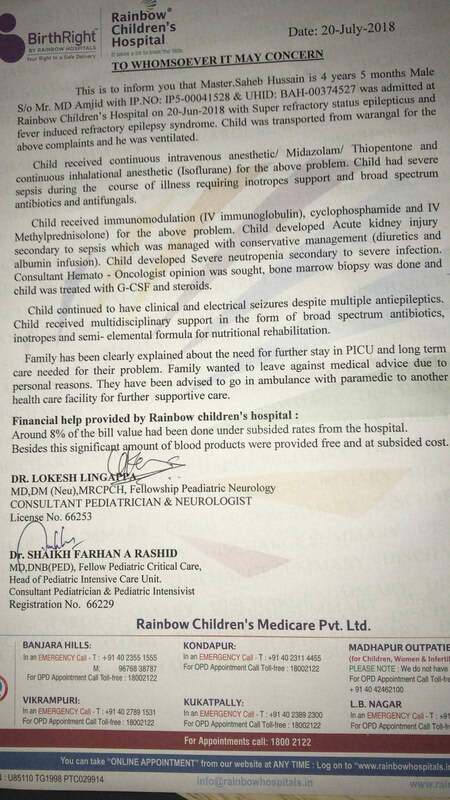 All the funds have been utilized to settle down the hospital expenses incurred during his course of treatment. Saheb's condition is currently critical. He has low blood sugars for which medications to increase the blood sugar were started. He is having severe infection with low blood counts, his antibiotics were upgraded and medication to increase the blood counts. He also underwent multiple blood and platelet transfusions. He is currently on ventilator support and multiple anti-epileptics drugs. He is also requiring transfusions. Doctors have suggested that he will stay in PICU for next 2-3 weeks. Thank you so much for your support up till now. We shall keep you all posted.